3rd Championship Of RRLeagues Almighty Autumn Revealed! The 3rd series to be revealed in RRLeagues Almighty Autumn '17 line up is Season 9; GTR3 Championship! No sooner had the dust settled at Suzuka that drew the curtain on RRLeagues most successful season yet, we go straight back in for another season of this popular class. 6 rounds of 60 minute races commencing on 13th September will determine the driver and teams champion. Registration opens next Thursday (24/08). Check website and forum for details. Track poll currently open in forum. All welcome. 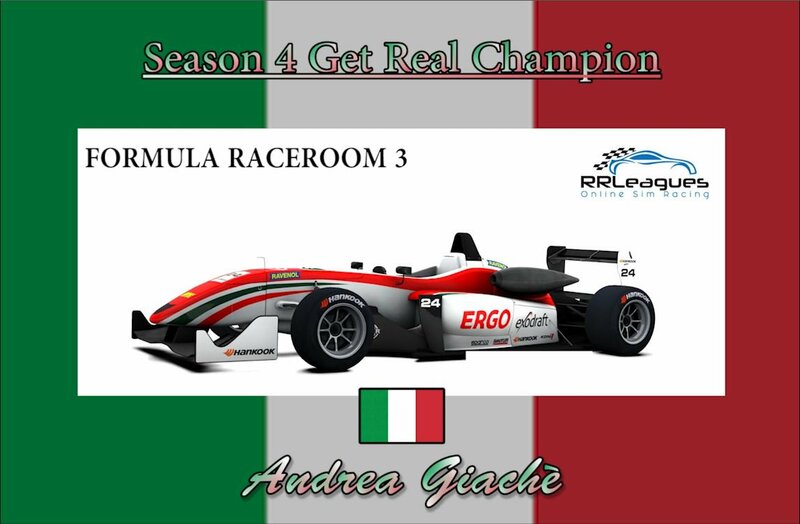 RRLeagues interview FR3 Champion Andrea Giachè! On the back of his success at Monza i caught up with our new FR3 Champion Andrea Giachè, as we reflected on the Season 4 Get Real Championship. 2nd Championship Of RRLeagues Almighty Autumn Revealed! As one championship ends, another is announced! The 2nd series to be revealed in RRLeagues Almighty Autumn '17 line up is Season 8; FRX-17 Championship! The pinnacle of the RaceRoom formulas look set to be a well received addition at RRLeagues after much hype and anticipation surrounded their recent release. A 6 round calendar on a bi-weekly schedule commencing on 10th Sept will see individuals and teams compete for honours in our friendly community. Registration opens next Monday (21/09). Check website and forum for details. Track poll currently open in forum. All welcome. Giachè secures title on home soil!